The journalism students at Temple University wanted to start from scratch. They wanted to come up with their own code of ethics. Rules that would guide them as they set out to cover a crisis engulfing their city — and allow them to build trust with people at the heart of it. They wanted to hold up solutions that could stem some of the death. In Philadelphia, we are at a point in the opioid epidemic where the devastation has pervaded so much of our city's daily life that Temple is offering a journalism course on how to cover it. In Jillian Bauer-Reese's classroom, student journalists are thinking intently about navigating a crisis worsened by stigma and shame. It's something many newsrooms are still struggling to do (including my own, which recently decided to stop using the word addict in stories — a good step, but a belated one). Bauer-Reese, an assistant professor who is in long-term recovery and writes about the language we use in a crisis, said she wanted her students to cover the epidemic thoroughly while thinking carefully about how their stories would affect their subjects. "Why shouldn't that be a consideration in every newsroom?" she asked me. It should be. Her class' work is out this week. 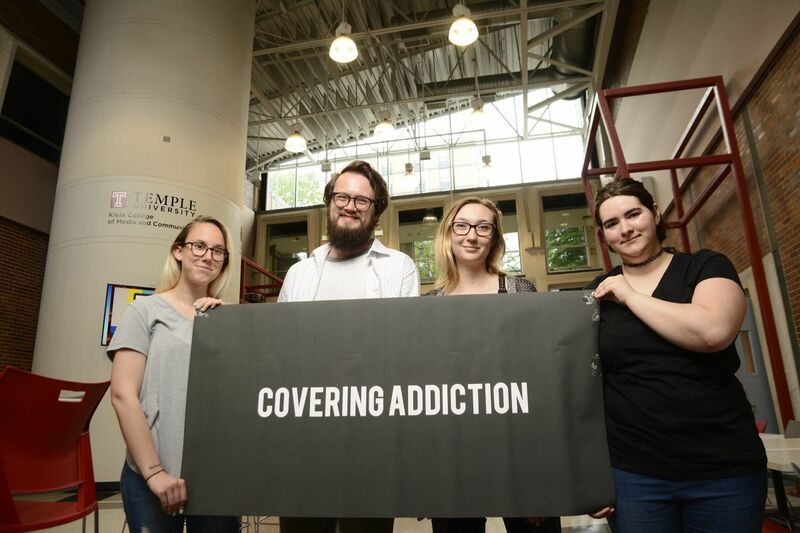 It's called Covering Addiction, and it's a comprehensive look at every level of the crisis — from harm reduction to recovery to policing to housing to healing. It's not just good work for student journalists. It's just good work. They put up a table in McPherson Square Park, where I started my coverage of Kensington last year. They set out a tablecloth that read "Covering Addiction," and stocked the table with index cards. They asked passersby — and the survivors and front-line advocates and recovery specialists and first responders they invited to their classroom — to answer a simple question: What can the media do better? The students wanted to understand: How do you portray a crisis while protecting the dignity of the people most affected by it? Covering Addiction is a comprehensive look at every level of the crisis — from harm reduction to recovery to policing to housing to healing. They debated whether to use people's names (they decided they would be flexible), and whether to take photos of people actively using drugs. The latter was their biggest debate. Schaefer and others decided that we're at a point in the crisis where there are enough of those photos. For Nico Rossi, 28, who just graduated and returned home to Scranton to work a reporting job, those types of images show the true extent of the crisis. Rossi overdosed on OxyContin six years ago, he said. His father found him, not breathing, in his bedroom. He's going back to Scranton to write about the crisis there. "I think people should see those pictures so they know what people in addictions are going through," he said. "I know it's ugly. No one wants to see it. But that is what it is." These are conversations that, in many cases, don't have easy answers. As Schaefer said, we're all human beings. When I was reporting from Kensington, I often wondered what it would have been like for my family to pick up the paper while my brother was struggling with addiction, and read a story about him. If he were alive today, he might have been on Kensington Avenue. Who would have tried to tell his story? And how would they do it? What struck me most about talking to the students was that none of them wrote their stories from the classroom. They went to the neighborhoods hit hardest. They met people where they were. And they listened. "We're student journalists," said Jenny Roberts, the executive editor of the project, who just graduated with degrees in political science and journalism. She means they were students first — that they just wanted to learn. "We were able to get so many people to open up to us." That's a lesson for everyone covering this crisis, and everyone trying to understand.